First do no harm is a good maxim for Earth Day in more than one way. Many will think of it in the most obvious terms – don’t harm the planet. But, it is also a reminder to be thoughtful about actions intended to help the environment, but which may do more harm than good. Here are six environmental myths people can give up this Earth Day. Contrary to the claims of the environmental left, buying local food dramatically increases environmental harm. At the University of Washington tomorrow, the Earth Day presentation will feature a speaker promoting “transformation” of the food system to support “small-scale organic farmers.” Organic farming is fine, but it is primarily a luxury for the wealthy and widespread use would dramatically increase the use of water, fertilizer, and even pesticides. If we moved to local production for 40 major crops, research shows the U.S. would have to increase land use – and the water and fertilizer that goes with it – by 60 million acres, about the size of Oregon. Politicians who push plastic bag bans point to photos of the bags harming marine life. They ignore the far more damaging, but less obvious, impacts of cotton bags. Consumers would have to use a cotton bag every week for 11 ½ years just to break even compared to using plastic bags that whole time. The number of honeybee hives in the United States is at the highest level in 20 years. You wouldn’t know that by listening to some environmental groups, who claim honeybee populations are falling. As a beekeeper, I have an interest in protecting honeybee health, but those who make these claims know almost nothing about the issue. Although the percentage of hives that die each year has increased from about 20 percent to about 35 percent, the U.S. Department of Agriculture notes that beekeepers are replacing lost hives and increasing the total number of bees. Additionally, the threat to honeybees is not pesticides but the varroa mite, which attaches itself to honeybees. Agricultural beekeepers, whose bees are most exposed to pesticides, have the lowest mortality. Imagine spending a dollar to save a dime. Despite the perception that solar energy is free, that’s exactly what taxpayer subsidies for solar power do. Solar panels enjoy huge taxpayer subsidies, despite the fact that most people who can afford to install them are rich. Even with improvements in solar technology, the Energy Information Administration estimates solar panels will still cost thirty percent more, on average, than natural gas. In Washington state, this is even worse. The National Renewable Energy Laboratory indicates Seattle receives half the solar radiance as Arizona or California. Even though the energy is “free,” the cost to install solar panels means we pay far more than with other energy sources and a much higher cost to reduce CO2 emissions. The Governor’s carbon tax bill this year lamented that climate change is “already” causing Washington state to experience “depleting snowpack.” This claim ignores the fact that for the 2017-18 winter, snowpack finished at 119 percent of normal. It wasn’t an anomaly. 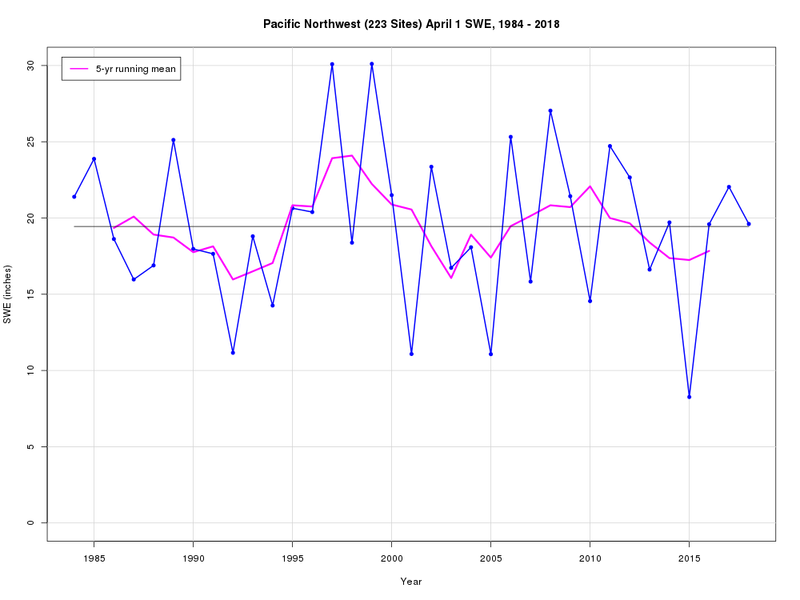 Ten of the last twelve years have seen above normal snowpack in Washington state. The snowpack myth persists despite clear and consistent data. Former State Climatologist Mark Albright of the University of Washington charted snowpack across 223 sites across the Pacific Northwest and found average snowpack has been steady for more than 30 years. We can still believe that climate change will have future impacts, but the impulse to ignore basic data shows how politics, not science, is driving the discussion on climate policy. Two years ago, a line to preorder the Tesla 3 stretched three blocks in Seattle, with people eager to place deposits on a car they had never seen or taken for a test drive. If you have the disposable income to commit to a car, sight unseen, you don’t need a tax break as an incentive. Later this year, Washington’s sales tax break for electric vehicles will expire, but it was unnecessary from the beginning. For wealthy buyers of Teslas or the Nissan Leaf, a tax break simply offers tax breaks for the wealthy and gives politicians an opportunity to take credit for supporting cool technology while doing little to incentivize car sales or improve overall fuel efficiency or reduce CO2 emissions.